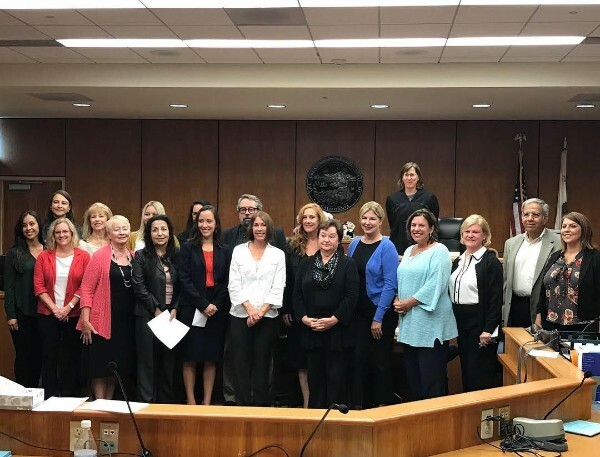 The CASA Summer Flex class of 2018 pose with Judge Tari L. Cody after she administered the Oath on October 2, 2018. To be eligible to become a sworn officer of the Court, each CASA must successfully complete and pass thorough background checks, an interview, and approximately 40 hours of training and thereafter complete 12 hours of In-Service training annually. The curriculum has been created by National CASA and California CASA and covers such topics as: laws relating to child welfare and foster care, child development and family dynamics, child abuse and neglect and mandated reporting, effective advocacy, and other matters affecting juvenile dependency.